If you're a wine enthusiast and would like to start a home business, Traveling Vineyard may offer the type of business opportunity you're looking for. Traveling Vineyard was created in 2002 from an idea conceived by Rick Libby to create a home wine tasting branch of Geerlings and Wade. He believed that the whole concept of wine appreciation and wine tasting was intimidating for most people and that many consumers purchased wine based on the picture on the label or the price of the wine rather than its taste. Libby convinced Geerlings and Wade to run with his idea and he was named the first president of the new company. Libby then set about building the Traveling Vineyard. A few years later, Libby left Geerlings and Wade. By 2010, Traveling Vineyard filed bankruptcy only to be bought and saved by Libby himself. By November of that year, Traveling Vineyard was back up and running and officially under new ownership. Today, the company continues to grow. 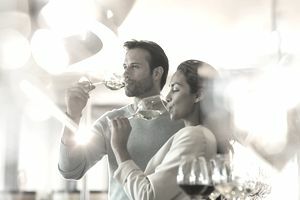 The Traveling Vineyard markets its wines through private wine tasting parties that are served by its network of Wine Guides, who are essentially independent wine consultants. The consultant presents wines during the tasting event much like they would be presented at a winery. The popularity of home wine tastings continues to grow as more people are introduced to the concept. To learn more about this home business opportunity and to gain some insight first-hand from an actual wine consultant, or "Wine Guide" as the company calls them, I interviewed an independent wine consultant for Traveling Vineyard. What does a wine guide/consultant for Traveling Vineyard do? We conduct in-home wine tasting events. We bring several bottles of wine to the host or hostess' home for their guests to taste. We provide background information on each wine that is tasted as we guide them through the four basic steps of wine tasting. What prompted you to become involved with Traveling Vineyard? A friend told me about Traveling Vineyard and thought I should have a home wine tasting party. I told her I loved the idea but that I thought I should conduct the wine tasting parties myself! I just knew I liked wine and I enjoyed people. I thought Traveling Vineyard's independent consultant opportunity was the best of those two things all wrapped into one package. I just got to it and never looked back. That was one of the best decisions I ever made and it truly changed my life in such a positive way. How would you compare your work with Traveling Vineyard to your prior work life? It's not only fun but it's flexible! I am in charge of my own business and my own schedule. I can do as much or as little as I want. If I want to give myself a raise, I work a little harder. As a teacher, I had to work set hours on a set schedule. Does your work allow you enough flexibility to achieve the type of work-life balance you'd like? I think the work and family balance is something we all constantly want to improve. It's quite a challenge to achieve balance in anything, but the rewards are worth the effort when you figure it out. Because I'm in charge of my own schedule, I don't have to work set hours and I can take vacations and be home with my children whenever I want. Do you have an office in your home? What's your home office setup? I have an office in my finished basement. I tried to work at the kitchen table when I started but the disorganization began to affect my business as it grew. I feel it's very important to have a clearly defined office space – even if it's in the corner of a room. With children, you need to identify the boundaries of your work-space. No Play-doh allowed! What does the company look for when choosing new consultants? Anyone can become a wine consultant with Traveling Vineyard, and becoming a consultant is very simple. The majority of the consultants are wine enthusiasts, not experts. They enjoy earning income while increasing their own knowledge and appreciation of fine wine. Our consultants receive training and continual support from their sponsor, the consultant they join with, and one-on-one sessions with a local Traveling Wine Leader. I have individual training and support calls, a monthly team meeting call-in, a team website and many other support tools for my team of consultants. We have tasting notes for each wine which are written for us by our team of wine experts. What are personality traits beneficial to a wine consultant's success? I believe that when dealing with people it is very important to be upbeat and enthusiastic. I have fun while providing some basic wine education at the same time. We want to take the intimidation out of the idea of wine tasting, something that so many people possess because they do not know how fun wine and wine tasting can be. How does a wine consultant earn income with Traveling Vineyard? The wine consultants earn a marketing fee for the wine orders placed at their wine tasting events. There are also all kinds of incentives for consultants like incentive trips all over the world. Each month there are opportunities to earn additional rewards and incentives for various things based on consultant activity. What kind of time commitment is required of a Traveling Vineyard consultant? Hobbyist – Becomes a consultant because of the love of wine, wants to earn a discount on wine and accessories, has a desire to meet others, wants to earn a little extra income. These consultants are usually people who work full time in other jobs or are leading otherwise busy lifestyles. They usually do a minimal amount of activities, such as one or two wine tasting events per month. Part Time – Typically conducts at least one or two wine tasting events per week. Stay at home moms and dads often fall into this category, as do those who are employed part-time. Full Time/Career – This is the category I fall into. These consultants can see that there is an incredible business opportunity in The Traveling Vineyard and decide to pursue it. This category comprises stay at home moms and dads, those who are looking for a career change, those who are newly unemployed, retirees, and people who love wine and have always wanted to be in the wine business. The consultant can terminate the relationship at any time.